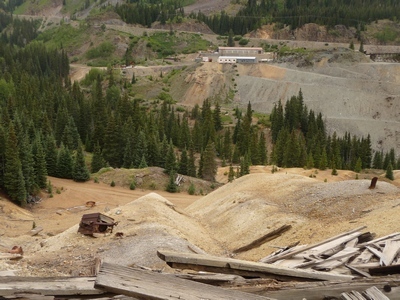 Coming along Ouray County Road 31 from north to south, here's your first view of the Yankee Girl Mine. I took a long ride yesterday. One road I traversed is a road I’ve rarely traveled, Ouray County Road 31. It goes through the heart of the mining district and literally next to the famed Yankee Girl mine. I took so many photos of the old gal that I’ll devote this post just to her. See here for companion post with GPS track and photos of other old mine works. Technically, this is the “headworks,” meaning the building that houses the elevator equipment. The mine itself is a vertical shaft beneath this structure. Now I’m going to take this opportunity to belabor the obvious. 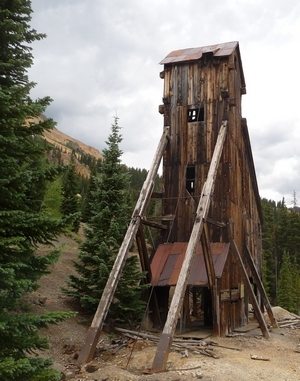 OLD MINING STRUCTURES ARE DANGEROUS! You, and you alone, are responsible for your safety. Some of the old buildings have been stabilized, but that just means keeping them standing. No one, and I mean no one, has done anything to rope off the bad parts. Be careful! Here's another look at the headworks. Here’s the old gal from another view. Note the sturdy braces for the top—that’s where a large beam hangs that holds up the entire elevator. It had to be strong enough to haul the ore up from down below. The Yankee Girl mine was one of the most productive of all the mines ever dug hereabouts. The building’s outline is iconic—you’ll see it reproduced all over the place. Its outline, or a drawing, show up on restaurant menus, in various drawings depicting the area, tourist guidebooks, and so forth. This is likely because the building’s outline is different from most in the area. It doesn’t just look like any old building—there’s nothing like it anywhere around here. The sign describe's the mine's significance. Here's another sign, more recent. So what was the controversy? Well, there’s a constant tug-of-war between those who own the mines (meaning own a patch of land on which there’s a mine) and those who want historic structures preserved. Some of the owners assert it is their right to tear these old structures down and build their dream home on the property. Others assert that really the Forest Service ought to be given ownership and treat the structures as something to be preserved. It so happened that ownership of the Yankee Girl passed to a fellow who was quite argumentative. He threatened to tear the structure down if he didn’t get his way. No one took him seriously at first—the county commissioners said they’d have to issue a destruction permit, something they wouldn’t do—but then a structure a couple miles down the road did get torn down. This really got people’s attention—the public outcry was enormous. So…things happened, ownership transferred, and the current owners have put the place into a trust for preservation. Bravo! View across the valley. That's the Idarado works across the valley, along with Hwy 550. I recently attended a lecture by one of the people involved in the building stabilization. His group recreates foundations for the old buildings (the early miners were a bit hasty in this regard), makes sure the roof is relatively tight, and installs “companion” beams to stiffen up the structure. While working on the structure, he found some interesting cables no one had paid any attention to before. He speculated that toward the end of the old girl’s life, the railroad had already been ripped out, so a long cable went across the valley so cable cars could take ore over to the Idarado. Note the debris. Step carefully! 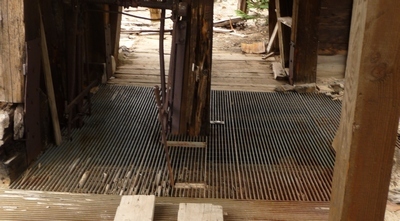 The picture to the left provides a closeup of the debris near the mine. 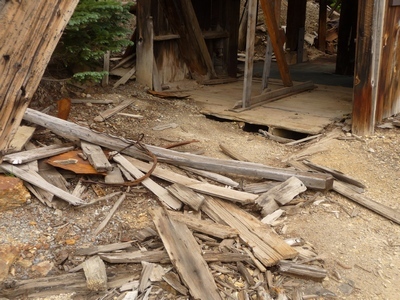 Structural stabilization does not mean restoration. This is actual debris. Leave it where it is. Also, don’t go wandering across it—those old nails are still sharp. The picture also provides a look at the base on the north side. There’s lots of wood-dirt contact, not good for the wood in the long term. The back side. Note the paucity of sound wood! County Road 31 winds up around the back of the old structure. Note how much is missing. Weather and age has not been kind to the old gal. Kudos to those doing stabilization work! The picture to the left is of a small sign. You can see where it is in the previous photograph. 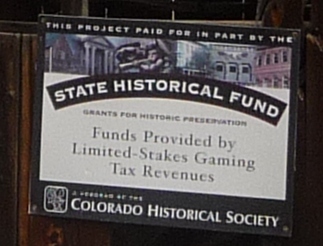 The sign notes that restoration money comes from “limited stakes” gambling revenue. I have mixed feelings about this. Gambling revenue is a regressive tax—it preys upon the poor and those who can least afford to lose the money (and nearly everyone loses—winning at gambling is a myth). On the other hand, it has provided revenue for stabilization projects that would otherwise be unfunded. Me? I’d rather pay slightly higher state taxes and do it up right and proper. 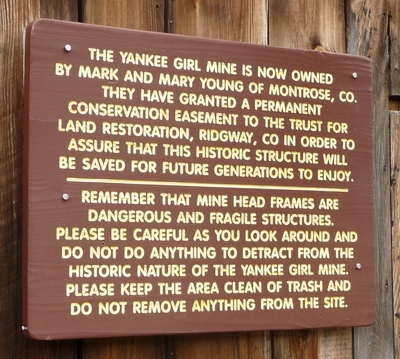 So there you have it: several pictures of the iconic Yankee Girl Mine. It’s on Ouray County Road 31, an easy (beginner) motorcycle ride. In fact, you can get a car such as a Blazer to the Yankee Girl if you come in from the north. To traverse the entire road, please use a motorcycle, 4-wheeler, or Jeep(-like) vehicle—or just park and go for a hike! In the view across the valley, I see I have been close, on 550, many times, and never managed to get there, as always in highway vehicles. 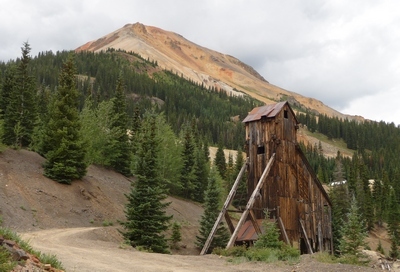 Have been visiting the area since the mid 1950’s, and wish I had photographed more, as some old structures are gone, such as the mine at the southern entrance to Silverton that I climbed around way back then. Hard to believe people would want to build even a summer home in an area often inaccessible and famous for avalanches in the winter. 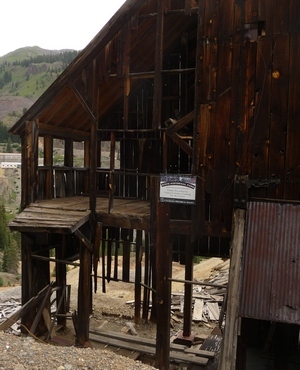 The fact I return again and again and the area is famous, for ghost town, mining, and railroad fans, should be a clue that government needs to protect these structures industriously AND the major tourist dollars these attractions bring. These structures are history and worth the equivalent preservation of Mesa Verde, and maybe should all be, like Death Valley now, with its famous mining history, part of a large national park, the Silverton-Ouray National Park or the Mears Mining and Railroad National Park? My grand Uncle John M Lindsey was a prospector in the Silverton, CO area around 1886. He mentioned meeting a prospector in Silverton who sold his share of Yankee Gold mine for $38,000 and eight months later was broke. He was cursing the country because it was hard times. Enjoyed your pictures and thanks for sharing.